In my years here, I have participated in passionate and heated debates on virtually all aspects of Chinese politics and society. What is the true nature of the government? Can the Chinese educational system produce creativity? Is the country rising or falling? All of these topics are capable of rending friendships, dividing rooms and spoiling a perfectly good dinner party. And yet none produces the same level of incandescent conflict as the question of whether or not China can do desserts. China has an evident sweet-tooth. A walk down the candy aisle of any Chinese supermarket is trip to a tinsel-wrapped wonderland of waxy treats of infinite variety. True, I’m occasionally sucker-punched by spicy dried beef, which is often wrapped like candy, but a lot of it actually is candy, at least loosely defined. And what Chinese restaurant meal is complete without the fruit plate? If you’re lucky, the fruit plate might even be spouting dry-ice fog. Dinner and a show – what could be sweeter? One of the very first gifts I was given after starting work in China was a box of tangyuan. (I learned an important lesson:tangyuan are meant to be cooked. Hence the “tang“.) And the price people in this town will pay for Häagen-Dazs is second only to the price they will pay for ridiculous luxury watches, a phenomenon I’ve been able to study since our overheated local Häagen-Dazs shop is just around the corner from our local ridiculous-luxury-watch boutique. It’s not just urban. The meanest, most wretched outhouse of a rural provision shop will somehow manage an ice-cream cooler, even if the refrigeration is powered by a mule on a treadmill or local orphans trudging around a giant “wheel-of-pain” like the one that turned a skinny waif into Arnold Schwarzenegger in “Conan the Barbarian.” I once had fresh made ice cream in a one-donkey town in Xinjiang in the foothills of the Pamir Mountains. It was awesome. Possibly because I was on the verge of heatstroke at the time. Which raises a question: Does one need to be under some kind of physical duress to appreciate desserts in China? Admittedly, I have a roaring sweet tooth, apparently inherited from my father. I might my strap my own son into the wheel of pain if Häagen-Dazs Rum Raisin ice cream came out of the far end, especially given that it costs $13 a pint here. But ultimately, I’m open minded when it comes to Chinese desserts. I don’t just mean desserts obtained in China, but also desserts drawn from Chinese cuisine. Deep fried pumpkin bisuits. Red bean buns. Glutinous rice confections. Hot walnut soup. I’m pretty much OK with all of them. I still get bricks of blown honey when I walk through Qianmen, despite their proven ability to epoxy my jaws together for hours. And yet the derision I’ve come in for from western friends is shocking. I could tell foreigners that my hobby is driving two-inch galvanized roofing nails through the skulls of live ferrets and they’d get less worked than they do when I tell them I like Chinese desserts. This leads me to ask: Is it them, or is it me? Are they right? Is that I’ve finally gone native and this is how its expressed itself? Instead of fleeing into the mountains of Yunnan to start a sustainable flax farm I’ve simply decided that its OK to eat black sesame paste? Or are they narrow minded conventionalists whose eyes are fogged with a lethal mix of Oreo dust and crème brûlée? I won’t stand for that kind of cultural dessert imperialism myself. A century of hardship inculcates flexibility in confectionery. Just as almost anything can be food in China (especially southern China), so can nearly anything be dessert. If all you have is mutton and molasses, by god you’re having molasses sweetened mutton floss for dessert. This trait reaches its zenith is in its ability to take components that under other circumstances I’d be utterly contemptuous of and fashion them into miracles. I experienced this during a recent dinner with my colleagues at a restaurant called Green Tea, a sort of upper-middlebrow Hangzhou place with pretensions. Dinner was fine. But when they got to dessert they earned a place in my heart forever. When I moved to Singapore in 1995 I discovered the phenomenon that I came to think of as “Japanese-style” bakeries. If you live anywhere in Asia, you’ll recognize this genre of store as offering a range of vaguely sweet, soft white breads, sausage rolls and alarming-looking combinations of cheese and sugar. I’m expansive about desserts, but I’m a bread snob so I’ve always been completely disdainful of the entire genre. Seriously: My standards are high. I wept when the Fauchon in Shin Kong Place went out of business. They were priced and stocked for Marie Antoinette’s snottier cousin, but their breads were the best in Beijing as long as they were in business – and were the only thing I ever bought, which was symptomatic of their problem, I guess. Respectable French pâtisserie Comptoirs de France opened in Beijing four years ago and it took them until last month to come up with a loaf of bread I like (the sourdough). I’m also reasonably discerning about Ice Cream. Longtime readers will know that Mrs. Imagethief is a nutritionist. Among the many things I’ve learned from her is this: if you must indulge, do it right and don’t fart around with the small-time stuff. If you’re going to have ice cream and suffer the attendant guilt, you might as well have good ice cream. Bi-Rite salted caramel*, for example, or Strauss Mint Chip. Who wants to pound out the extra kilometers just because you caved on a pint of Baxy? No one, that’s who. So, like Nancy Reagan, I just say no to the soft bread and flavorless ice cream. Or, I did. Until that dinner at Green Tea. My colleagues ordered the house specialty dessert, 面包诱惑, which means something like “bread temptation,” though I think “bread seduction” would be better. 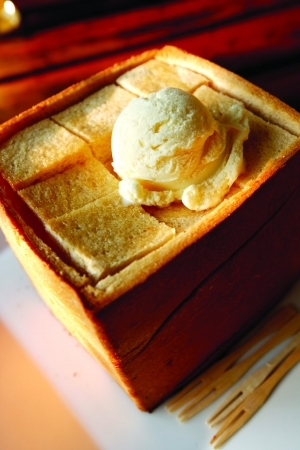 This is a cube of warm, freshly-baked, soft white bread, sliced into twenty-seven smaller cubes (three cubed – think about the geometry) with a scoop of generic vanilla ice cream melting on top. The heat from the bread melts the ice cream, which runs down into the cracks between the bread cubes and soaks into the crumb and, well, it’s just alchemy, dammit, because the result is gustatory lead transformed into dessert gold. I swear when the waitress carried the first one in the world turned to slow motion while “Thus Spoke Zarathustra” played in my head. You’ll know that as the music that Stanley Kubrick used at the beginning of “2001: A Space Odyssey” to introduce us to a twenty-minute segment of a featureless monolith teaching apes to beat each other to death, which says something important, though I’m not sure what. It is the call of the Sirens rendered into cheap bread and ice cream because, speaking of monoliths and ape-like behavior, we ate three of these things. By which I mostly mean thatI ate three of them. I am told that other restaurants have cribbed the idea, but that so far they all lack some…je ne sais quois. Worryingly, I’ve also learned that there is a branch of Green Tea around the corner from my house. So, is it a Chinese dessert? Well, not really, I suppose. But it’s Chinese ingenuity applied to Western components with bang-up results. And if that isn’t domestic innovation, well then, what the hell is? The government should be proud. Happy New Year to all readers from Imagethief. This entry was posted in Uncategorized and tagged China, Food, Resident Alien, Weird. Bookmark the permalink.